Red with black roof, rear deck, rear panel, grille, base and interior. Opening doors. 'Glazed' headlights. Ferrari badge on the bonnet, 'Ferrari' lettering in silver on the rear deck, and '348ts' rear number plate. The wheels are black with silver detailed centres, and the rear axle is fitted with a pull-back motor. Excellent condition, one small paint chip on the rear roof edge. It is in a fair-to-good yellow, black and red 'Shell' window box which has suffered some wear and crushing, particularly at one end. 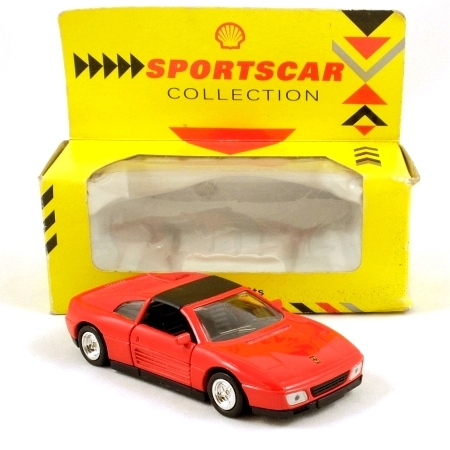 This model was marketed under the Shell brand as a forecourt promotion.